Before you can start using your ﻿crate for training, you need to know what to put in it to make it a comfortable, welcoming place where your dog will enjoy spending time. This article will look at what should and shouldn’t be allowed in the crate to keep your dog as safe and comfortable as possible. Keep reading to find out the dos and the don’ts! You can save 30% (+ Free Shipping) if you'll buy dog supplies at Chewy.com. 4. Enjoy your 30% off! Is it okay to leave water in a dog crate? Is it okay to leave food in a dog crate? What about covering your dog’s crate? What can you use as your dog’s crate cover? Since puppies are more likely to chew on and potentially swallow anything you put in the crate with them, safety comes first here. Avoid using blankets, towels, or sheets for your puppy’s crate bedding. She might chew on these materials, which will not only be messy but if she ends up swallowing pieces, it could lead to a life-threatening internal blockage and an emergency trip to the vets. It’s best to go for durable, easy-to-clean materials while she’s still in the puppy stages. A good crate bedding for your pup is Vetbed. This is widely-used in kennels and vets and comes highly recommended for its resistance to chewers. It is made of a very durable fabric, but it is also comfortable for your pooch to lie on. What’s more, it’s warm and insulating, non-allergenic, and has unique drainage properties, so that in the event of any accident, your puppy will stay dry and cozy. If you live in a cold climate check out this review of best dog house heaters and heated dog houses. Another type of durable crate bedding is the K9 Ballistics TUFF Crate Pad, recommended for light to moderate chewers. It’s made of super tough Ripstop Ballistic Nylon and comes without zippers or Velcro. It also resists water, hair, dirt, and odors, so it’s easy to clean and stays smelling and looking fresh. Plus it has a polyester-fill base to help your pup feel comfy and snug. It’s not a good option for heavy chewers, however, as it can still be destroyed by these more determined teeth. If your pup falls under the “aggressive chewer” category, an extra durable bed made from PVC, such as these from Frisco, may be in order. As well as the huge advantage of being chew proof, they are also designed to be cooling and easy to clean. Of course, once your puppy has proven she can be trusted not to chew, you can switch to a bedding of your choice. I advise you to begin by using a durable crate pad such as the ones above until that day comes, however. While this may sound pricier, it’s certainly worth it in the long run - who knows how many beds you might have to throw out and replace due to those persistent little teeth? Not to mention paying out for vet bills if she swallows shredded pieces of bedding. Some of the more destructive puppers out there have been known to destroy dog crate floors, too. If your dog is chewing or digging at the plastic crate tray, a good alternative is to invest in a chew proof metal one instead. Leaving toys in the crate with your pup can have many advantages, but, as with bedding, the same goes for toys - durable is best! You should never leave soft, stuffed toys or squeaky toys with your puppy, as she is likely to chew up and destroy them, and could potentially ingest pieces of them. These are not only extremely tough but also hollow, so you can also stuff them with food so that your pup stays occupied trying to get out the tasty treat. *Make sure it’s the right size for your puppy’s mouth. You can be more lenient with adult dogs concerning what they are allowed in their crates, but it all depends on whether they have outgrown their chewing habit. If your dog is a chewer, it’s best to stick with Vetbed for your dog’s own well being. Plus it will save you forking out for new beds every time they get destroyed. If your dog moves past the excessive chewing stage and you feel you can begin to trust her, you can give her a more luxurious, stuffed bed to sleep on. There are plenty of designs to choose from, so you can find one that suits your taste as well as her comfort needs. Adult dogs need toys to play with, too. While she may have learned by now not to chew on her bedding, it will still serve as an enjoyable pastime, keeping her mentally and physically occupied. As for the type of toys you give her, if you feel you can totally trust her not to cause destruction, you can allow soft toys in the crate if she likes them. If you’re in doubt, I advise that you stick to tough rubberized chew toys like Kongs just in case. Of course, she will need appropriate toys for her adult size. They should not be so small she could swallow them, nor so big she cannot fit them in her open mouth. So, if as an adult she is much larger than she was in her puppy days, you will need to upgrade! As a general rule, it’s best not to leave water in the dog crate, particularly when potty training your puppy. This is because it is likely to increase the number of accidents inside the crate, as puppies fill their bladders quickly. There may be rare occasions when you will want to leave water for your dog. For instance, if you are leaving your dog crated for more than 2 hours - particularly in hot weather - or if your vet recommends crating your dog for medical reasons. For these possible instances, it is a good idea to have the equipment available to provide your dog with water if necessary. A crate mounted bottle or bowl is best, as these will not spill or get knocked over. Apart from stuffed Kong toys, it is recommended not to leave food inside the crate with your dog while you’re gone. Not only is this likely to make a mess, but more importantly, your dog should have fixed feeding times rather than being able to “free feed.” This is because if she eats throughout the day in her crate, she is more likely to have an accident. While you shouldn’t leave food in the crate unsupervised, if you wish to feed her main meals inside the crate, that is absolutely fine. This will only increase her positive association with being in that space, which is exactly what we’re aiming for, right? Just make sure she’s able to leave to do her business after! This isn’t a black or white answer to this question, as it completely depends on your dog. Many dogs like a covered crate, while some don’t. Plastic or wooden crates are already fairly enclosed, but wire crates are very open and may not give your pup the den-like atmosphere she wants. A covered crate can provide a sense of coziness, comfort, and safety for a lot of dogs. It is also a useful way of reducing stimulation for anxious dogs who get distracted by what’s going on around them or for territorial dogs who feel the need to guard. Some dogs, however, take comfort in seeing their surroundings and may get anxious upon the crate being covered. The only way to know if your dog likes it is to try it. The best way to do this is by introducing the cover slowly. First, just cover the roof of the crate for a couple of days, then include one side for a couple more days, and then include both sides, and so on. You should be there at all times while they are getting used to it. Don’t leave them home or overnight with the crate covered before you know they are okay with it. It is important not to cover all sides of the crate, as they still need ventilation for temperature control and fresh air. Like anything new and unfamiliar, your dog may object at first. However, if after a couple of days of trying out the cover your dog shows true anxiety, whether by whining, scratching at the crate cover or clawing or chewing at the crate, it’s her way of saying she doesn’t like it. You should remove the cover and stop the process, as continuing will just cause her stress. If your dog seems relaxed and at ease, enters without showing signs of anxiety, and sleeps with the crate covered, it’s highly likely that she likes it and you can leave it in place. I highly recommend that you try it out. For the dogs who like it, you won’t know unless you go through the process! Many people use old towels or sheets to cover their dog’s crate. While these may be fine for an adult dog who can be trusted not to pull them into the crate and chew on them, it is best that you get a proper cove﻿﻿r for your puppy’s crate. Crate covers are fitted to the size of your dog’s crate, can be easily attached, and usually have handy panels that you can roll up to adjust how much or little cover your dog has. They are available in a range of styles and patterns, so you can be sure you’ll find one to suit your taste. Another option that could be more practical for you is to position the crate in a corner so that 2 sides of it are covered by the walls, and then simply use a wooden board on top of the crate to cover the roof. This way, your pup won’t be able to cause destruction, plus you can use the board as an extra surface! So, now you know what to put in and on your dog’s crate, but where should you put the actual crate itself? The first thing to consider here is that dogs are social animals that like to feel part of the family. So, it’s best to put your dog’s crate in a busy area of the home, such as the living room. If you shut her away in a quiet room, she may feel excluded and even punished, which is the opposite effect you want to create. Remember that the crate needs to be a positive place where she wants to spend time. The second thing to think about is temperature. Make sure that area you decide to put the crate isn’t draughty, close to a heat source like a radiator or fireplace, nor in direct sunlight. Your dog needs to feel comfortable while inside the crate, which means not getting too hot or too cold. Many people ask if at night they should put their puppy crate in the bedroom or not. Indeed, your puppy will have been used to sleeping with her mother and littermates, so it might be a bit of a shock for her at first to spend the night alone. This can often lead to long whining sessions as your pup adjusts to her new home. To reduce the feeling of loneliness for your puppy - and for you to get undisturbed rest - I recommend that you place the crate in your bedroom for at least the first few nights. Her being able to see and smell you will comfort her and help her to settle down to sleep. Plus, she will feel more at home in her crate from the beginning, rather than seeing it as a place of isolation and loneliness. If you don’t plan for the bedroom to be her final sleeping place, I wouldn’t recommend leaving your puppy there for more than 2 weeks. Any longer than this and she may resist a change of position in the future. If you do want to eventually move her out of the bedroom, then I recommend a slow transition to where you want your pup to be. After the first few nights sleeping near you, you can start to move her crate further away each evening before she goes to sleep. The first night, place it near the bedroom door, the second night, just outside the door, the third night, in the hallway, etc. If she protests, try making the transition more gradual, moving it every other night instead. A crate needs to be a comfortable, enticing place for your dog to spend time. Now you know what you should and shouldn’t put inside to make it a safe and comfortable environment for her. As to whether to cover the crate or not, this depends on your dog’s personality, and you’ll only know if she likes it by trying it. 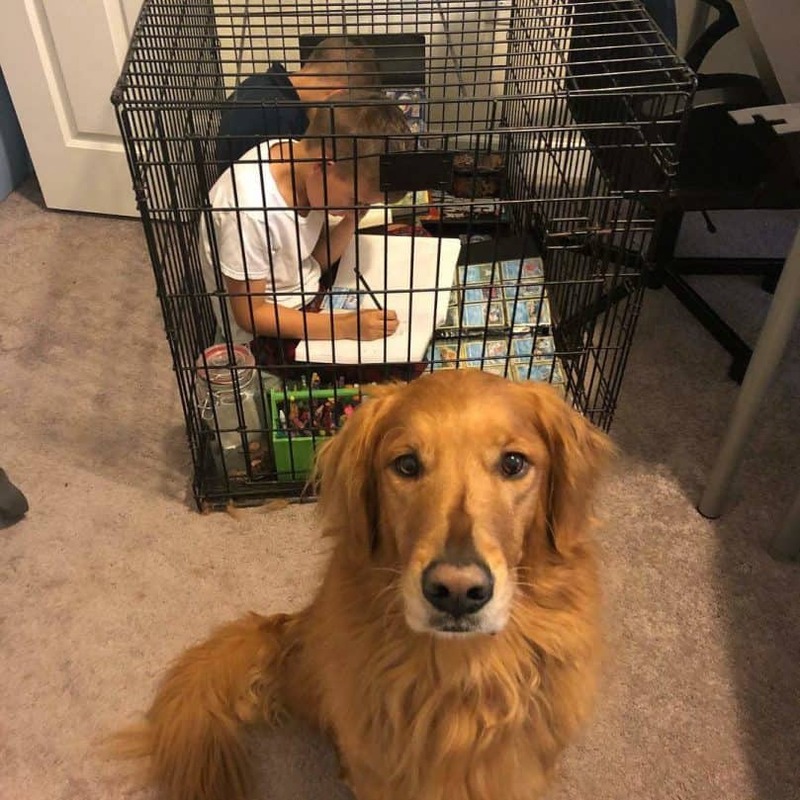 Finally, it’s best to put your dog’s crate in a busy area of your home to make her feel part of the family. Once you have the crate all prepared and your pup is feeling at home, you will be ready to start crate training. We live in the City. Our apartment has large windows at a busy intersection. Yet, it is spacious enough where parts of the apartment are not subject to the daily grind (noise). Our question: we are bring home a 9 week French Bull Dog in a week and don’t know whether to keep the crate near the window, or secluded, near a wall, while we are at work. We could see the noise either being a positive thing that keeps him busy or a stressor, that scares him. Any advice would be great. Thank you. Very helpful…we are first time puppy owners,,Huge help! If we put the crate in the bedroom at night, which has worked, where do we put her and the crate when we leave? Will she see the crate as a punishment?